Ministry of Finance issued a notice stating to release part salary of November month in cash i.e., Rs. 10000/- by 23 November 2016. The salary will be released for Non-Gazetted Employees of working under Central Government. 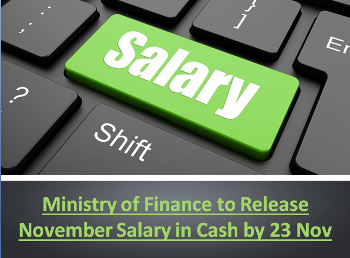 Ministry of Finance, Department of Expenditure issued a notice stating to release part salary of November month in cash by 23 November 2016. The part salary amounting to Rs. 10000/- will be released for Non-Gazetted Employees of working under Central Government as per the approval of President of India. The notice states that in case if the employee does not wish to receive the salary before the existing salary date then he/ she may give their option in the prescribed proforma to their respective Drawing & Disbursing Officer by 18 November 2016. In case any information is not received from any employee it will be presumed that the candidates has opted for part cash pay-out however, if the option is received on time, the salary will be credited on last working day of November 2016. Residual part of the salary will be payable as per the existing procedure.